It's all about speed for today's digital business leaders who rely on low-code development platforms, says Forrester Research Inc., which today published a ranking of the various offerings. "Real" developers may have derided the RAD, visual, DIY, drag-and-drop tools as toys for amateurs in the past, but there's no doubt they're making inroads in enterprise development shops because of the pressing need to get customer-facing software out the door sooner. "Speed is crucial in introducing new disruptive products, engaging and responding to customers across different channels, and adapting existing services based on shifting competitive drivers," says the new Forrester Wave: Low-Code Development Platforms, Q2 2016 report (provided by vendor OutSystems). 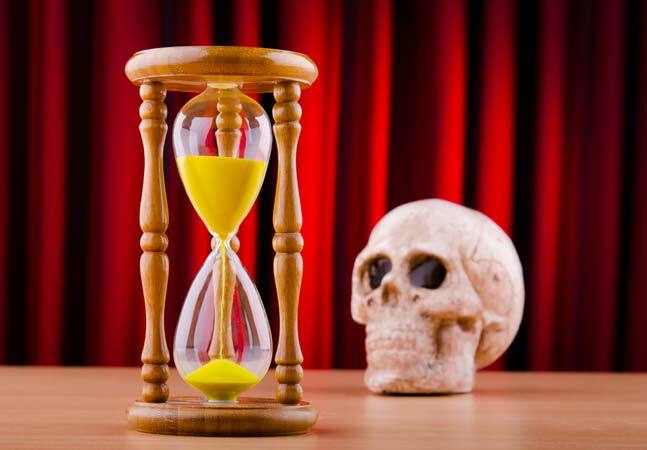 "This relentless focus on 'digital speed' is forcing AD&D [application development and delivery] leaders to reach for new approaches and platforms that enable delivery of new apps in days and weeks, instead of months. This shift is also forcing AD&D leaders to augment coding in programming languages, such as Java and C#/.NET, with new development platforms that emphasize declarative and visual development." The research firm started tracking these platforms in 2014, officially describing them as "platforms that enable rapid delivery of business applications with a minimum of hand-coding and minimal upfront investment in setup, training and deployment." In the face of a developer skills shortage, they can relieve the pressure on professional coders by letting "ordinary" business users produce apps, usually mobile or Web. If nothing else, the increasing legitimacy of the low-code platforms is borne out by the sheer number of new entrants into the market. The firm identified 42 platform vendors and five industry segments in its research. Even more telling is the reliable advice to "follow the money." Forrester noted: "Since February 2015, two of the midsized low-code vendors, K2 and OutSystems, received new rounds of funding of $153 million and $55 million, respectively. Additionally, in March 2016, QuickBase was acquired by Welsh, Carson, Anderson & Stowe, a technology-focused private equity firm." Perhaps it's no surprise, then, that one of the leaders of the pack of 14 finalists selected for the Wave study is OutSystems. 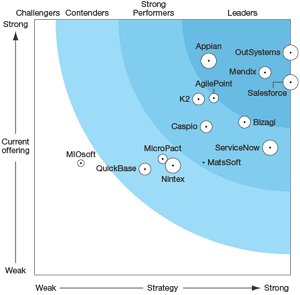 "Forrester's research uncovered a market in which OutSystems, Appian, Mendix and Salesforce lead," the report stated. "AgilePoint is on the boundary between Leader and Strong Performer. 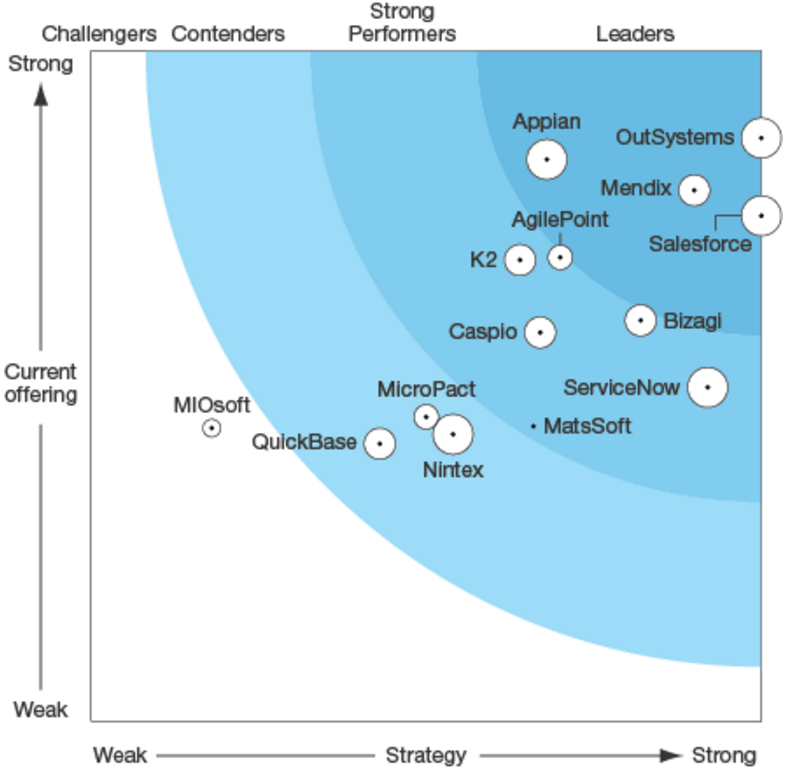 K2, Bizagi, Caspio, ServiceNow and MatsSoft offer competitive options. MicroPact, Nintex, QuickBase and MIOsoft lag behind." Those rankings are based on three criteria: breadth of tooling; built-in support for modern dev practices; and availability of free initial access so companies can experiment and learn about the products to see if they're a good fit. "Organizations today are seeking new ways to fast track their move to digital business by delivering engaging mobile and responsive Web customer experiences that can differentiate them in the marketplace," OutSystems said in a statement today. "Digital transformation requires a fundamental change in how apps are built and delivered, and low-code platforms radically accelerate that journey. Low-code platforms unlock innovation and expand development ability beyond IT to business teams, helping reduce backlog and compress delivery times from months to weeks." Not that there aren't some caveats for enterprises considering the low-code approach. An employee of MatsSoft, one of the studied vendors, alluded to as much in answer to a question about what low-code products/services are available, posed on the Quora Q&A site. "My one caution about most of these products is the intended developer audience," said Nigel Warren in his answer. "Who are you trying to empower to develop applications? Business people or IT specialists? Several of the products are really aimed at IT departments. Unless you're prepared to invest in a significant paid training and consulting, several of these products will not suit a business developer audience. Few if any of these platforms genuinely eliminate the need for programming." A reader named Alyssa Ideboen also provided an answer: "It depends if you are looking for a platform that allows you to develop apps or if you are looking for a tool that offers a full lifecycle to develop and deliver apps. There are low/no code platforms that provide you with development capabilities -- but then the actual deployment and continual management of those apps turn into a whole new can of worms -- often creating challenges of integration, app upgrades and maintenance and what have you."